The Astronaut Scholarship Foundation was created to ensure that the United States would maintain its leadership in science and technology by supporting some of the very best science, technology, engineering and math college students. The organization awarded its first seven scholarships in 1986. Each founding Mercury 7 astronaut sponsored a $1,000 scholarship, and they then began to fundraise to support future scholarships. Today, the Astronaut Scholarship Foundation awards fifty scholarships valued up to $10,000 to each selected scholar. The Astronaut Scholarship is the largest, merit-based monetary award given in the nation to science and engineering undergraduate students. Harvey Mudd College is one of 27 institutions—and the only non-doctorate granting school—selected by the foundation to participate in the program. The first Harvey Mudd recipient of the Astronaut Scholarship was Ken Easton ’89, who received the award in both 1987 and 1988. Here are the College’s Astronaut Scholars, beginning with the most recent. Information was compiled from interviews, news stories and Harvey Mudd College Magazine articles. Harvey Mudd College physics major Nina Brown ’19 was named an Astronaut Scholar for the 2018–2019 academic year by the Astronaut Scholarship Foundation (ASF). 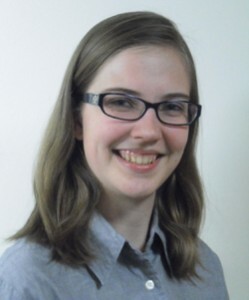 She is the 25th Harvey Mudd student to receive the honor. In August, Brown attended the ASF Innovators Gala in Washington D.C., where she received her award and spent time getting to know other foundation members. After graduation from Harvey Mudd, Brown plans to work in industry for a few years, then pursue a PhD in condensed matter physics. “I’d ultimately like to work in a field that has a clear, positive impact on people’s lives, such as developing clean energy technology or working in science outreach,” she says. ASF scholarships provide up to $10,000 each for college students pursuing careers in science, engineering and mathematics. The scholarship rewards students who exhibit initiative, creativity and excellence in their chosen field. The balance between real-world applicability and long-term research goals is not always easy to achieve. But, that doesn’t deter Charles Dawson ’19, winner of the prestigious Astronaut Scholarship for the 2017–2018 academic year. “In my career, I hope to find this balance by being mindful of the bigger picture of how to bring technological developments in the real world while pursing research at the frontiers of my field,” Dawson said. “Fundamental research has the capacity to address many of the problems facing humanity today, from energy sustainability to space exploration, but only if the scientists and engineers who conduct that research keep those problems in mind. Dawson, an engineering major, is the 24th Harvey Mudd College student to be named an Astronaut Scholar by the Astronaut Scholarship Foundation, which provides scholarships of up to $10,000 each for college students pursuing careers in science, engineering and mathematics. The scholarship rewards students who exhibit initiative, creativity and excellence in their chosen field. Dawson spent the summer of 2016 at Georgetown University working on computational physics research in the field of active colloidal materials, which can be used to model bacterial films and certain classes of nano-particles. Last year, he worked with physics professor Jim Eckert in the Magnetism Lab studying the electrical and magnetic properties of metallic novel materials. “So far, I’ve worked on measuring the magnetic properties of multi-layer metallic films typically several nanometers thick that might one day be used to improve the storage capacity and speed of magnetic hard drives,” Dawson said. His research experiences both here and at Georgetown not only taught him valuable experimental and analytical skills, but have also challenged him to ask bigger questions. “I’ve learned that it’s not enough, for example, to find out how the magnetic properties of a material changes with its composition; you have to think about how that dependence can be used to improve the various systems built on top of that material,” Dawson said. The creative challenge of adapting a system to new and untraditional components is something Dawson enjoys pursuing outside the research lab through various independent projects. He is building and programming control systems for an aerial robot that flies using only two motors. Limiting the number of motors presents several challenges since each motor must double as a source of thrust and a carefully controlled source of torque to control the orientation for the robot. “One of the things I enjoy most about projects like this is that, in addition to posing fun and interesting new challenges, they allow me to dive deeply into a wide variety of topics from control to electrical engineering, and gain a deep understanding of every level of the system I’m designing,” Dawson said. “I use improv mainly to decompress, relax and have fun away from my class work,” Dawson said. 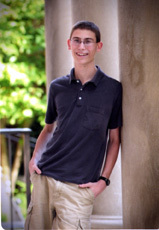 After graduation, he plans to attend graduate school to explore the intersection of physics and engineering with an eye toward applying new advances in physical understanding to engineering applications. 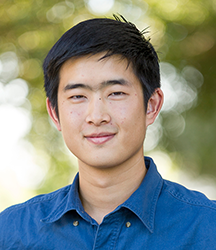 Mathematics and physics double major Calvin Leung ’17 is the 23rd Harvey Mudd College student to be named an Astronaut Scholar by the Astronaut Scholarship Foundation, which provides scholarships for college students pursuing science and technology careers. Leung is one of 40 recipients of the prestigious $10,000 award for the 2016–2017 academic year. To be eligible for the Astronaut Scholarship, students must demonstrate innovation, creativity, exceptional performance or unusual drive in their research fields, be in high academic standing and be actively involved in research. Candidates must be at least sophomore-level students in engineering, mathematics or applied or natural sciences and must be nominated by a faculty member. In 2014, Leung worked with Dr. Soumya Mohanty of the Laser Interferometer Gravitational-wave Observatory (LIGO) Scientific Collaboration—a team of international physics institutes and research groups dedicated to the search for gravitational waves—at the University of Texas, Brownsville, to develop an algorithm for the detection of gravitational wave signals. Since the most interesting gravitational wave events don’t have robust theoretical models to back them up, Leung says, there is interest in developing algorithms to detect arbitrary gravitational wave signals in noisy data. 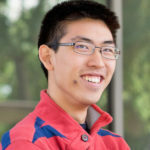 Using evolutionary optimization and techniques from machine learning, Leung developed a data pipeline that synthesized data from multiple gravitational wave detectors, including LIGO, in order to pinpoint the source of the signal and extract the waveform accurately even without prior knowledge of what the signal looked like. More recently, Leung has been involved in two research projects: one devised by him and another with Assistant Professor of Physics Jason Gallicchio. Over the last four semesters, Leung developed a fast and effective way to quantify the resolution of a camera—research he’s excited to incorporate into Physics 134 (Optics Lab) curriculum and to submit to the American Journal of Physics. With Gallicchio, Leung has been building an experiment combining cosmological observation with quantum optics, examining light from distant quasars billions of light years away to determine whether quantum mechanics offers a correct description of the universe. Like most Mudders, Leung is about more than his research, wearing many hats on campus. “When I’m not in the lab, I get paid to geek out as an Academic Excellence physics tutor,” Leung says. In addition, he has been involved with the Honor Board since arriving as a first year, and he was the Judiciary Board chair in 2015–2016. After graduation, he plans to obtain his PhD in physics and join the effort to bring gravitational wave astronomy to fruition. For now, he’s thankful to those who’ve helped him along the way—particularly his family. Senior engineering major Sherman Lam has become just the eighth Harvey Mudd College student to be awarded a second-year Astronaut Scholarship by the Astronaut Scholarship Foundation, which provides scholarships for college students pursuing science and technology careers. Students who earn the prestigious $10,000 award in their junior year are eligible to apply for a second year. Lam received the award during the 2014–2015 academic year for demonstrating exceptional academic performance and dedication in robotics research in the Lab for Autonomous and Intelligent Robotics (LAIR), under the advisement of engineering Professor Christopher Clark. He receives it again in 2015–2016 for his continued research. Begun in spring 2015, Lam’s current project is a tensegrity-based spherical rolling robot. Together with Clark, Lam sought to create a more robust robot for lava tube exploration. Their idea is an elastic, spherical robot that can be dropped into a lava tube, land safely and navigate the space, regardless of landing orientation. The “tensegrity” is an elastic structure that allows the robot to absorb the impact of a fall, while its spherical shape allows the robot to roll around by shifting its center of mass. This summer, Lam interned at NASA’s Jet Propulsion Laboratory with the Extreme Environment Robotics Group, where he created a miniaturized and highly mobile wall-climbing robot for surveillance and exploration applications. µDROP, “Micro Durable Reconnaissance and Observation Platform,” is equipped with many small hooks (“microspines”) embedded in flexible wheel structures. These microspines can adhere to rough surfaces, allowing the platform to climb rough, vertical walls. Miniaturization included designing a new, small-scale printed circuit board for the onboard microcontroller and sensors, testing new microspine designs and prototyping a highly flexible chassis. He was the first to step outside a spacecraft without the safety of a tether. He helped space-test NASA’s Lunar Module along with the life-support backpacks and rendezvous methods later used by the Apollo 11 crew that landed on the moon. He played a leading role in saving the first Skylab mission after the craft’s thermal shield ripped off during launch. And, now, Apollo 9 astronaut Rusty Schweickart is coming to Harvey Mudd College to share his mission stories and honor a fellow space enthusiast. On Wednesday, Oct. 2, during a public ceremony, Schweickart will present Harvey Mudd senior Joshua Edelman with a $10,000 scholarship from the Astronaut Scholarship Foundation. His talk is free and open to the public. A De Pietro Engineering Fellow, Edelman participated in the NASA University Student Launch Initiative last year, helping to design, build and launch an 80.4-inch-long reusable rocket. 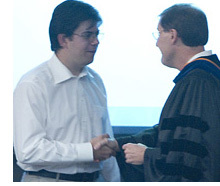 He received the 2012-2013 J.R. Phillips Engineering Award for his work on a supersonic rocket drag analysis project. In 2009, Edelman interned at NASA Marshall Space Flight Center on the Aerodynamics Team performing wind tunnel tests on the Ares V.
Schweickart’s talk will focus asteroids—as rich cosmic ore bodies, stepping stones to Mars and Rosetta Stones to human life. He will discuss the threat of asteroid impacts and what might be done to address this cosmic natural hazard.Harvey Mudd is one of 27 institutions—and the only non-doctorate granting school— selected by the Astronaut Scholarship Foundation to participate in its program. To date, the foundation has awarded more than $3 million to students nationwide; $210,000 of those funds has been awarded to HMC students. The scholarship presentation and lecture will begin at 4:15 p.m. in the Shanahan Center Auditorium at Harvey Mudd College. Harvey Mudd College chemistry major Katerina Hilleke ’13 has been selected as a 2012-13 Astronaut Scholar by the Astronaut Scholarship Foundation (ASF), which provides scholarships for college students pursuing science and technology careers. She is one of 22 students nationwide this year to receive the $10,000 award, given to rising juniors or seniors who have demonstrated initiative, creativity and excellence in their chosen field. Hilleke spent the past 18 months exploring ways to synthesize beilschmiedic acid C, a natural antibacterial product found in the bark of the Beilschmiedia anacardioides tree species in Cameroon. Discovered in 2009, the compound proved a more potent antibiotic than ampicillin. Hilleke’s contributions to the HMC community include serving as an Academic Excellence chemistry facilitator and as a tutor for students in the Group Theory, Quantum Chemistry and Spectroscopy course. She’s also a member of the Claremont Colleges Ballroom Dance Company and the Aztec dance group Danzantes Del Sol. Her future plans include graduate school, performing catalysis research and, possibly, becoming a teacher. Captain Bruce McCandless presents the award to Paul Riggins ’12. 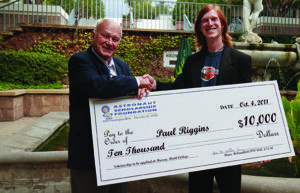 HMC physics major Paul Riggins ’12 of Whittier, Calif. has been selected as a 2011-12 Astronaut Scholar by the Astronaut Scholarship Foundation (ASF), a non-profit organization providing scholarships for college students pursuing science and technology careers. As an Astronaut Scholar, Riggins will receive a $10,000 award. Astronaut Scholars are selected based on academic performance, merit and capability in academic research and must attend one of the 19 institutions ASF supports, be entering their junior or senior year or pursuing a master’s degree and be nominated by a professor. Riggins, who is interested in pursuing teaching and research, has been on the dean’s list for the last three years. In Spring 2010, he was awarded the Rojansky Prize by the HMC Physics Department for his term paper on quantum mechanics. He is an experienced tutor, as part of the Physics Academic Excellence team and as a physics workshop tutor preparing first-years for their upcoming mechanics course. Riggins has a strong interest in music and theater and has been active in both since high school. Most recently he was a part of the 5-C a cappella group Mood Swing and the Joint Music Program’s Chamber and Concert Choirs. He performed in a theatrical production last summer performed by La Habra High School alumni. Riggins and classmate Dhruv Ranganathan ’12 conducted a research project on the algebraic geometry relevant to string theory with advisor and mathematics Professor Dagan Karp and HMC Mathematics Department teaching and research postdoctoral fellow Ursula Whitcher. Riggins and Ranganathan have presented their research at various seminars and meetings, including at the Western Algebraic Geometry Seminar at the University of Arizona; the Algebra, Number Theory, and Combinatorics Seminar hosted by the Claremont Center for the Mathematical Sciences; and Joint Math Meetings in New Orleans. The research team is currently writing a paper to be submitted for publication. Riggins continues to study string theory in his summer research project, currently underway with advisor and physics Professor Vatche Sahakian, which will explore more accurate models for black holes. Senior Andrey Sergeivich Shur is among 20 recipients nationwide of the 2010-2011 Astronaut Scholarship, the country’s largest monetary award based solely on merit for science, math and engineering undergraduates and postgraduate students. This year’s scholarships totaled $200,000. The awards are granted by the Astronaut Scholarship Foundation, a nonprofit organization founded in 1984 by the six surviving original Mercury astronauts. The foundation supports the nation’s global leadership in science and technology by providing scholarships for college students who exhibit motivation, imagination, and exceptional performance in these fields. Apollo Astronaut Walt Cunningham with Brian Teague ’10. 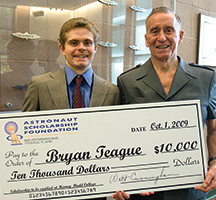 Apollo Astronaut Walt Cunningham presented Harvey Mudd College (HMC) senior Bryan Teague with a $10,000 scholarship from the Astronaut Scholarship Foundation (ASF) during a public presentation and ceremony Oct. 1 in Galileo McAlister on the HMC campus. The Astronaut Scholarship is the largest monetary award based solely on merit that is given in the United States to science and engineering undergraduate students. Eighteen of these prestigious awards were dispersed this year through the ASF to outstanding college students majoring in science, engineering or math. Over $2.8 million has been awarded in scholarships to date, $190,500 to HMC students. These well-rounded students exhibit motivation, imagination and intellectual daring, as well as exceptional performance, both in and outside, the classroom. Teague, son of Terrance and Leslie Teague of Boulder, Colo., will graduate in May 2010 with a degree in general engineering. He is interested in electric cars and worked with a team at the University of West Australia, where he studied for a semester, to try to convert a Lotus Elise to a fully electric vehicle. Teague is equally involved with materials science, specifically energy and power generation and has worked on developing photo initiated thiolene polymers. He is also a candidate for senior class president. In his spare time, Teague enjoys biking and backpacking. Cunningham was selected by NASA as an astronaut in October 1963. On October 11, 1968, Cunningham, Wally Schirra and Donn Eisele were launched aboard Apollo 7 – the first manned flight of the Apollo Program following the tragic Apollo 1 fire. The 260-hour, 4.5 million-mile flight was a success and provided NASA with confidence to send the next Apollo crew, Apollo 8, into orbit around the moon. Cunningham retired from NASA in 1975 and was inducted into the U.S. Astronaut Hall of Fame in 1997. He currently serves on the ASF Board of Directors. 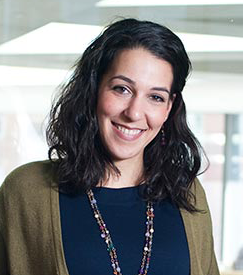 The Astronaut Scholarship Foundation (ASF) has named Nadia Abuelezam ’09 an Astronaut Scholar, a prestigious honor bestowed on only 19 college students each year. 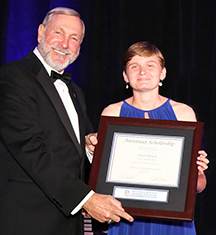 Candidates, nominated by faculty members from a handful of designated colleges and universities, receive a $10,000 scholarship for their continuing education. This summer, Abuelezam, who is from San Mateo, Calif., will be working with The AIDS Support Organization in Uganda, Africa. She will be trying to improve the efficiency of the organization’s HIV/AIDS clinics and centers by optimizing their anti-retroviral drug distribution. While in Uganda, Abuelezam will also be working with high school and middle school students. “I am bringing along letters from fellow Mudders encouraging these Ugandan students to continue their education,” she said. As an Astronaut Scholar, Abuelezam joins the company of recent HMC graduates Samuel Eisenberg ’08 and Robert Panish ’06. 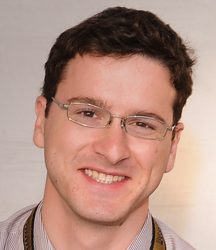 Eisenberg, a physics graduate and co-founder of the environmental group Mudders Organizing for Sustainability Solutions, was named an Astronaut Scholar both in 2006 and 2007 for his outstanding work in the field of magnetic materials. In 2007, during a public presentation and ceremony, Space Shuttle astronaut Gordon Fullerton presented Eisenberg with his award. Panish, an engineering graduate with an interest in space vehicle design, received the Astronaut Scholarship in 2005. As a scholarship recipient, he was invited to the Kennedy Space Center in Florida, where he attended the annual Astronaut Hall of Fame Induction Ceremony, met with astronauts, attended VIP tours of the space center and walked under the Space Shuttle Endeavor. He was also featured on the cover of ASF’s May 2006 magazine, which focused on his research with Engineering Professor Zee Durón ’81 creating an early warning system for firefighters that will predict structure collapse. Since receiving the Astronaut Scholarship, Panish has remained actively involved with the ASF, attending the organization’s annual meetings and speaking at a 2006 gathering commemorating the 40th anniversary of the Gemini 12 flight. “Any scholar who chooses to go to the annual meeting develops lifelong friendships with the other scholars as well as meaningful relationships with dozens of former astronauts, including men who walked on the moon,” he said. The ASF, established in 1984 by the six surviving members of America’s original Mercury Seven astronauts, was created to ensure that the United States would maintain its leadership in science and technology in the future by supporting promising college students who exhibit motivation, imagination and exceptional performance in the science or engineering field of their majors. While scholarship recipients must display intellectual prowess, the committee also looks for well-rounded students who are involved in campus and community activities. To date, the foundation has awarded nearly $2.5 million in scholarships to 226 deserving students, according to the organization’s website. 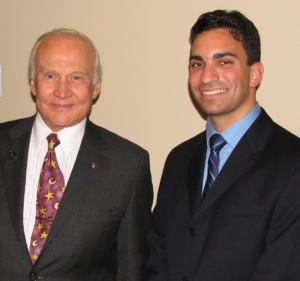 Astronaut Buzz Aldrin with Robert Panish ’06. Robert Panish ’06, an engineering graduate with an interest in space vehicle design, received the Astronaut Scholarship in 2005.